The Traders Action Zone (TAZ) is a buy and sell zone on a chart that swing traders can use to identify possible reversals in a stock.This is just simply "area" that we look at to see if a stock that is in a strong uptrend, after pulling back to this area, will likely reverse. The name T-30 refers to a "tail" that slices down through the "30" period exponential moving average. This looks like a hammer candlestickpattern on the chart but it doesn't have to be a perfect hammer to be considered a T-30. Also, the color of the real body is not important. This tail on the chart flushes other traders out of the stock. 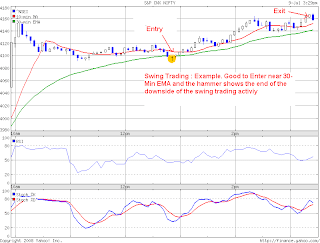 When you are trading any kind of tail or hammer pattern, always look for volume to be higher than the previous day. This suggests that many traders were shaken out and demand is picking up. Put your stop under the low of the hammer.